This homemade carpet cleaner does a great job at getting the stains out. You hardly need to work on it at all. It is so easy. However, we still get stains and dark spots that drive me crazy. Today I thought I would share our homemade carpet cleaner. It is the absolute best cleaning solution. Your carpet will be good as new with these cleaning solutions. 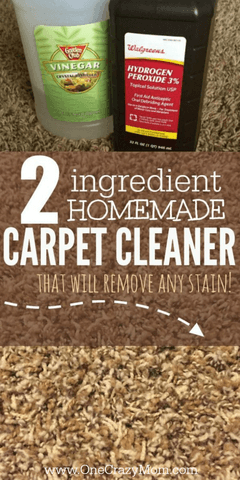 This the best homemade carpet cleaner! Homemade carpet cleaner with peroxide does the trick every time. 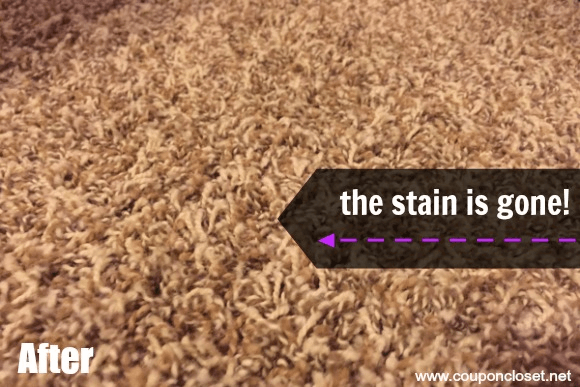 If you do this on a regular basis to treat stains, there will be no need for professional cleanings or purchasing a carpet cleaning machine. The money you will save is going to really add up with this carpet cleaner. DIY carpet cleaner is the best. 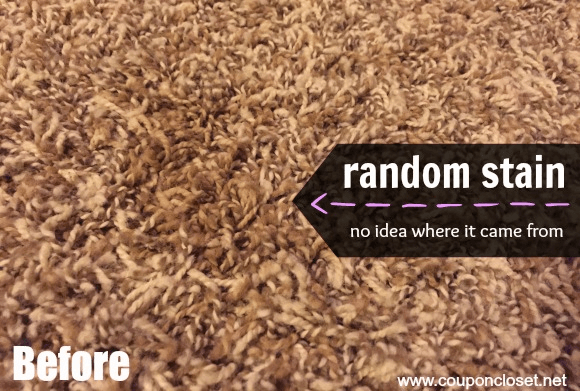 Clean carpeting is going to be a breeze with these tips. What can I clean my carpet with? Sure you can purchase something from the store but it’s laden with chemicals. Plus, have you seen the price of some of those store bought carpet cleaners? They are crazy expensive. And I really just do not like the idea of all those chemicals in the house. 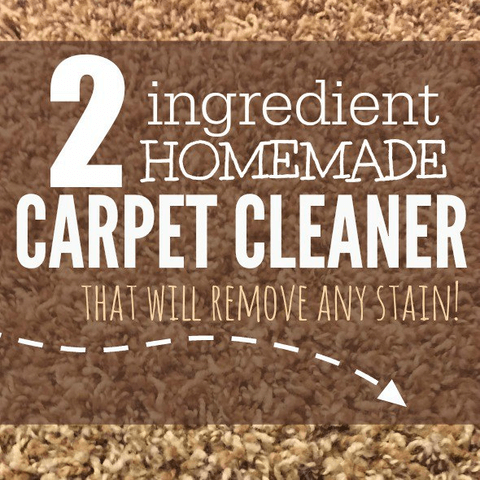 You truly can clean your carpet with 2 natural ingredients. No need to use pricey carpet stain removers. Is vinegar good for cleaning carpets? Yes! Vinegar and hydrogen peroxide are my 2 favorite ingredients for cleaning carpet. Trust me! You will have clean carpet in no time at all. I’m sure you probably already have both of these. We keep both of these on hand at all time in our house. That is really all that you need for this recipe for homemade carpet cleaner! 1. Just mix equal parts of Vinegar and Hydrogen peroxide in a bowl. Use immediately. 2. Pour the homemade carpet cleaner on the stain. Take a clean towel or rag and blot the stain. You will see the stain remover almost immediately. I normally use 1/2 cup of each. If you prefer, you can use a spray bottle to dispense the carpet cleaning solution. This homemade carpet cleaner with peroxide really does work amazing. The stains are gone almost instantly. We have used this on dirt, some dark juice, and this mysterious stain. It works all the time. You can even use this homemade carpet stain remover on red wine. 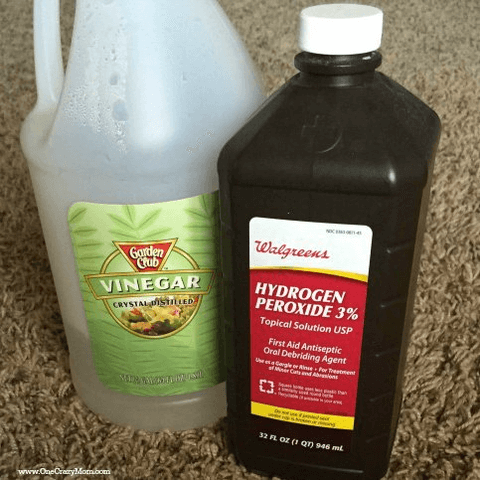 You will love how easy and inexpensive this homemade carpet stain remover hydrogen peroxide is! It works really well. 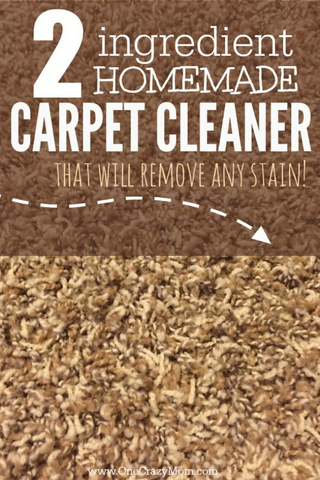 You are going to be amazed at how these 2 simple ingredients clean carpet. I even use homemade carpet cleaner pet urine. It works wonders to get out pet accidents. I think this works better than homemade carpet cleaner powder. This stuff is the best for removing stains and everything will smell so fresh. If it is a bad stain and recent, I often sprinkle baking soda down first and then vacuum it up. I will use the homemade carpet stain remover solution next. This is handy if it’s a really smelly stain and you caught it as soon as it happened. You can also add some essential oils for a fresh scent. I have even used dish soap and warm water to clean the carpet. Save a ton of money and learn how to make DIY Dryer Sheets at home. We have 10 vinegar uses you will love. These ideas are frugal and will help you all around the house with so many different things. Learn how to make Homemade Granite Cleaner that works great. This diy granite cleaner is easy to make and budget friendly. We love stain removing recipes! Save a ton from running to the store each time you need a good cleaner. Just whip up your own recipe and see how well it works. Not only does it save money but it does away with all those yucky chemicals found in store bought cleaners. I feel much better knowing I am not bringing that in my home. Learn how to clean a dry erase board that will get rid of even the most stubborn smudges. This DIY solution is budget friendly and works to clean your dry erase board perfectly. Learn how to remove blood stains quickly and easily with only 2 ingredients. If you are looking for easy ways to make your home and car smell amazing, try one of these DIY Air Fresheners. Learn where and how to start with these 5 home organization ideas that make getting things in order so easy! You can also find out how to soften towels quickly and easily. How to soften towels without fabric softener and freshen your towels. Are you ready to start Spring cleaning? Get this free spring cleaning checklist to help get you started and ensure you do not overlook anything! 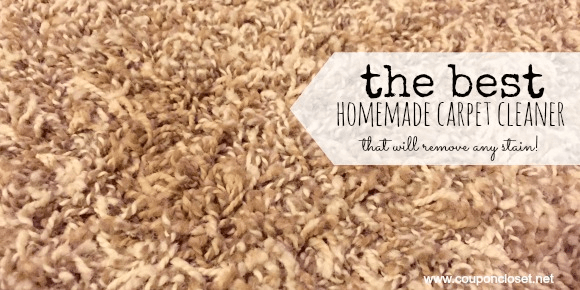 Thanks for finally writing about >Homemade Carpet Cleaner – Best Homemade Carpet Cleaner <Loved it!